Martorell, 16/03/16. - SEAT underwent a major undertaking last year on the road to reachingsustainable profitability. The company closed 2015 with a profit after-tax of 6 million euros,compared to a 66 million euro loss in 2014. Growth in sales and a product mix with a highercontribution margin were the two main driving forces behind the change. SEAT posted aturnover of 8.3 billion euros, 11% more than the previous year. This was the company's bestever result and double the revenue in 2009. Average earnings per vehicle increased by 3.5%. "SEAT's progress in 2015 was twofold – not only did we obtain a positive result for the first time since 2008, but we achieved it during a year of major challenges. We are implementing the right strategy that enables us to face the challenge of sustaining long-term profitability with optimism. We have a brilliant future ahead of us thanks to the launch of new products and the integration of new technologies in both the field of mobility as well as connectivity", pointed out Luca de Meo, President of the SEAT Executive Committee, during the presentation of the 2015 annual results. The growth in sales for the third year in a row, exceeding the 400,000 vehicle barrier in asingle year, was the result of recuperation in southern European markets such as Spain andItaly, the fifth consecutive year of growth in Germany, SEAT's main market, and the brand'ssuccess in Mexico. The sustained level of sales of the Leon and the Ibiza, with 2015 deliveries totalling 160,900(+4.4%) and 153,600 (+2.4%) units respectively, the strong increase of the Alhambra(+17.2%) and the success of the Audi Q3 were beneficial to the volume as well as to SEAT'srevenue, which grew for the sixth year in a row. With its robust business performance, SEAT was able to respond to the increase of spendings on advertising and marketing to enhance brand familiarity, greater personnel expenditure associated with an increase in employee remuneration and the considerable increase in investments and R&D expenditure for the launch of new models, such as the work done to adapt Line 1 at the Martorell factory to the new MQB A0 platform. In 2015 SEAT spent 586 million euros on investments and R&D, 28% more than the previous year. Over the last five years, SEAT's investment effort in this area has totalled roughly 2.7 billion euros. Overall, the operating result improved by 96% and stood at -7 million euros compared to the -167 of a year ago*. 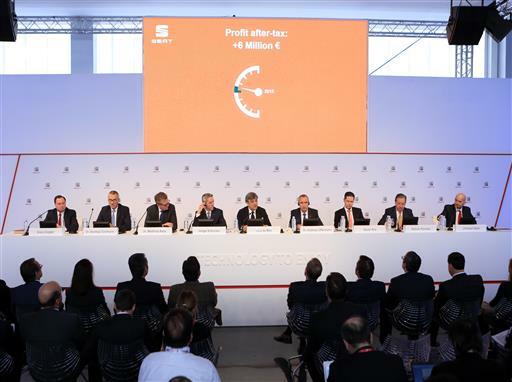 SEAT increased its ability to generate profit through its core activity. The company improvedits EBIDTA (earnings before interest, taxes, depreciation and amortisation) by 30%, reaching391 million euros, and increased operating cash flow by almost 50% to 781 million euros.The company's Vice-President for Finance, IT and Organisation Holger Kintscher pointed out that "SEAT continues to improve its capacity to generate its own resources to self-finance investments and consolidate the company from a financial standpoint. After several years of improvement, last year was a true milestone on the road to sustainable profitability". The increase in sales and production enabled the creation of 350 new jobs in the entire SEAT Group, including 100 engineers at the Technical Centre, which celebrated its 40thanniversary last year, as well as 48 young graduates of the company's vocational trainingschool. In total, the company destined 14 million euros to training programmes for itsemployees last year. SEAT expects to prolong its growth in 2016. Highlights for this year include the launch of theAteca, the brand's first SUV, which was recently presented at the Geneva Motor Show. Thenew model is a car that has been entirely created at the SEAT Technical Centre and will becommercially available this summer. The Ateca is just the beginning of the most ambitious product offensive in the history of SEAT. The company is going to intensify its commitment to the SUV segment and in 2017 will add a new model with the launch of a smaller all-road crossover to be developed and manufactured in Martorell. "This is excellent news for both the brand and our main factory because it is the fastest growing segment and symbolises a major step forward in making it the third pillar of the company, alongside the Ibiza and Leon families", stressed Luca de Meo. The company wants to be a reference in the automotive industry in the field of connectivityand has therefore entered into powerful alliances with technological leaders such as mobilegiant Samsung as well as SAP, the world leader in business applications and networks andthe Internet of Things (IoT). The company is making progress towards the next level of the connected car. SEAT'scommitment is focussed on developing and equipping its cars with the latest technology interms of connectivity and the utmost safety for drivers and customer data. In this sense,SEAT's CONNECT versions have been on European roads since the summer of 2015 with the launch of the new Ibiza. The CONNECT version is featured on the entire SEAT range and by now represents 15% of sales since it was launched in June 2015. The future calls for excellence in connectivity and SEAT intends to be at the vanguard of thistechnology. Company presence at the Mobile World Congress, together with Samsung, SAPand Accenture, for the second year in a row, is clear proof of SEAT's commitment to connectivity. (*) SEAT prepares its financial statements according to the Spanish General Accounting Plan, without including its subsidiaries. The Volkswagen Group applies international accounting standards (IAS/IFRS) and consolidates the SEAT brand figures.